Fewer than 20 per cent of brain tumour patients survive beyond five years of their diagnosis, compared with 86 per cent of breast cancer patients, revealed charity Brain Tumour Research in a major funding report recently. 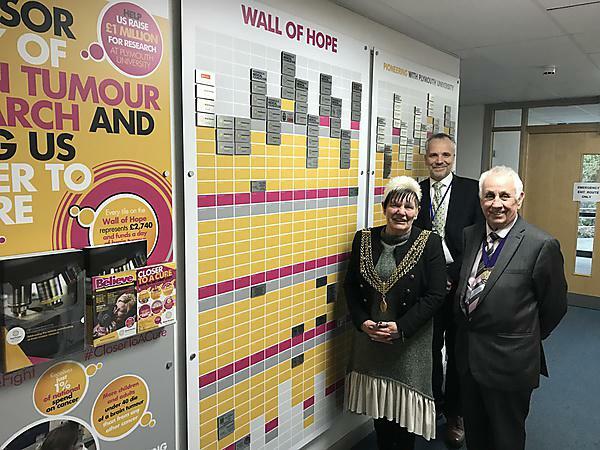 The shocking statistics drew the attention of the Right Worshipful the Lord Mayor of Plymouth, Councillor Pauline Murphy, who welcomed the opportunity to tour the laboratories at the Brain Tumour Research Centre of Excellence at Plymouth University last week. The Lord Mayor met Dean of Research of the University, Professor Oliver Hanemann, who is a world-renowned brain tumour scientist in addition to holding the post of neurology consultant at Plymouth Hospitals NHS Trust. Professor Hanemann has led the Brain Tumour Research Centre of Excellence since its launch two years ago. Brain Tumour Research is the only national charity dedicated to granting all available funds to sustainable life-saving research into brain tumours; supporting the UK’s largest dedicated network of laboratory-based scientists. The Centre at Plymouth University, launched in 2014, is a leader in the investigation of low-grade brain tumours.